This an American classic 4x4 pickup truck for Sale in Florida. As the picture is a Ford F250 Highboy 1975 model year still in excellent condition with 600K original miles ready to go for $10000. 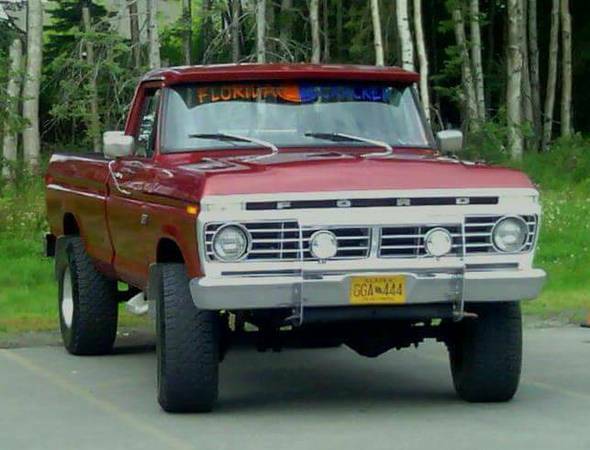 Looking to trade my 75 f250 it has a 390 with a 4 manual speed it has 660000 original miles on it it was bought to pull a plane back and forth to an airstrip and that's all the original owner and his son ever used it for in Alaska. I bought it when I was stationed up there and brought it home. I'm need to trade for another truck because I have a leg injury and the mechanical clutch is slowly killing my knee and hip. It has duel flow master exhaust and sounds great. It's sitting on 35 in xd diesel rims. It has a couple rust bubbles in the usual spots like the bottom of the door and bottom of rear fenders and the passenger side front fender has a crease in it. but I have a brand new fender for it and a new dash " no issues with it just bought it because it was at a parts swap" and have a few extra odd end parts iv picked up here and there. The tail gate is a little bent still looks fine just won't close all the way. Other than that the trucks a great truck and an awsome color and I get compliments everywhere I go in it. Really only looking to trade for another truck. 10000 located in Sebastian FL.